Is the PC market finally starting to turn a corner? It’s been a depressing picture of doom and gloom when it comes to predictions of PC sales for a long time now, but things are starting to turn around, with more positive estimations beginning to creep out – in this case, from Compal Electronics. Who? Yes, perhaps that’s a name you haven’t heard before, but Compal is a major ODM (original design manufacturer). That means it makes notebooks (as well as other hardware like displays) for a number of leading PC vendors including the likes of Lenovo, HP and Dell, so it's a firm at the very heart of the industry. And according to Ray Chen, president of Compal, notebook and desktop PC shipments are expected to reach 40 million units this year. That represents a growth of 10% compared to 2016, which is a major uptick that flies in the face of the sort of figures we’re used to seeing. Although he clarified that there will be a dip in the numbers for the first quarter, before momentum and growth gathers throughout the rest of 2017. As DigiTimes spotted, this positive prediction was aired at an investor’s conference earlier this week, where Chen also noted that the DRAM and SSD shortage would remain a bugbear throughout this year. The SSD supply problem is something we’ve been hearing a lot about recently, and while there could be more notebooks shipped in 2017, it’s unlikely that manufacturers will be switching to larger solid-state drives with these devices. Most laptops are likely to continue to run with 128GB or 256GB SSDs. Earlier this month, analyst firm IDC predicted that the overall PC market would remain roughly stable through to 2021, dropping by just under a single percentage point. Again, that’s a welcome improvement on the big slumps forecast repeatedly in recent times, and a lot of growth is expected to come from 2-in-1 detachables. 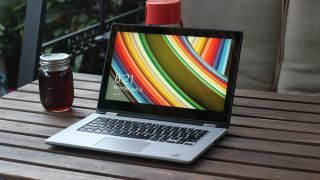 These hybrids have long been held up as a bright spot in the PC industry, with hybrid 2-in-1s (like Microsoft’s Surface devices) not just proving popular with consumers, but also with manufacturers as they can command a greater premium and increased profit levels compared to a traditional notebook.